To the World of Hagstrom vintage guitars basses and amplifiers! Baby blue pre amp for sale! Let's hope for a good 2019! Santas red HIII guitar is for sale! Still available! This autumn we will move our business from Rindö outside Stockholm to Munkagårda right in the middle of Skåne! A red KENT II bass will soon be available in the shop. Hagstrom HIII with rare "Viking" pickups now for sale in the shop. 2018 it is ten years since Hagstrom Vintage Guitars were founded. There have been ten exciting years and the business has grown a little bit each year. Since the start, we have sold more than 600 guitars, basses and amps and not a single customer has been dissatisfied with his instrument and sent it back! 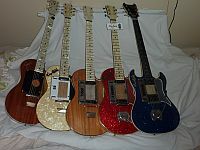 Rather, we have got many recurring customers who bought a large number of instruments over the years. Some customers have also become personal friends and have given us the opportunity to see new places in Sweden, Europe and North America. 2018 will be a trend break because we have now chosen to begin a gradual downturn and narrowing of our operations. This will mean fewer of the most common models (HI, HII, HIII, HIB etc) in our stock, but maybe more exclusive models. Possibly there will be some sort of "sale" a bit closer to the spring. Some types of questions sent to us via email will be referred to our facebook pages. In some cases, it will probably also take a little longer before we reply to emails and messages on facebook and messenger. The overall goal for us will be to work a little less (less hours) and enjoy a little more of life, but still be an active and important part of the Vintage Hagstrom community. A brownburst Concorde De Luxe bass will soon be available in the shop. A video presentation of the Small De Luxe, Sweetone and Standard 80 guitars is now available in the Museum & Guitar history section. on the market (shops, ebay etc) today are made in China. 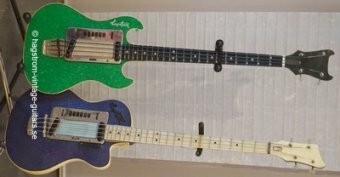 Probably fine instruments, but they are not made in Sweden! 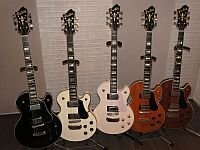 used and replacement Hagstrom spare parts as possible. Click on the picture to visit us on facebook!